Yes Jee this was my big moment too. Shocking non decision. The turnover immediately after Crozier's amazing mark. The turnover just trashed the magic team lifting effort of the mark and all the hard work we had achieved. We don't get reward for effort and they get gifted a goal. Crozier's diving smother cemented my nascent man crush. He's been an amazing pick up. Mine was Naughton's big marks in the third term - I realised at that point in time I was watching a Bulldog player pulling down some big marks and not someone from another team. I was thinking how all my mates would be wishing he was playing for their teams! I’ll go with this one as well. Great moment despite the overall result of the game. The moment was when this mark should not have been paid. Cox actually looks to have more of the ball than Crozier in that pic. Quick take it down. I like the thought that we got ripped off more than maybe it was a mark to Cox. Should've been an arm chop free against Crozier. Now that is the real question that needs to be considered. 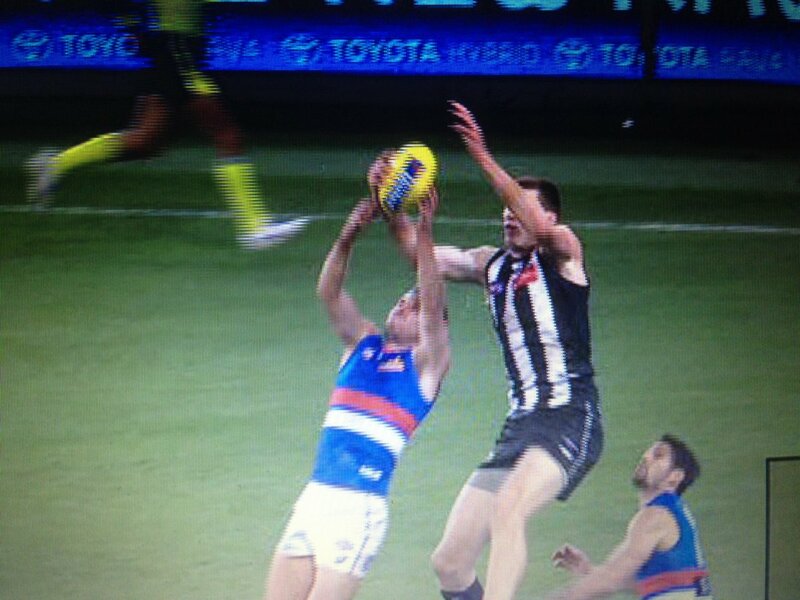 Personally I think Cox had more of it than Crozier, so it was either play on touched or a mark to Cox. How Cox was allowed to get to the contest is the real question. A question I ask rather often. Usually when he has the ball. What Fredi said. Caleb gives up 20-30cm a lot in games and affects spoils, blocks clear runs and/or body checks opponents. Wood is doing none of that. Hence why I asked the question, and I agree with Fredi, the footage leading up to that contest would answer the question about why in a still frame he looks like a passenger.